Golfer’s agent claims he was on the verge of quitting the game only months prior to his Open success. 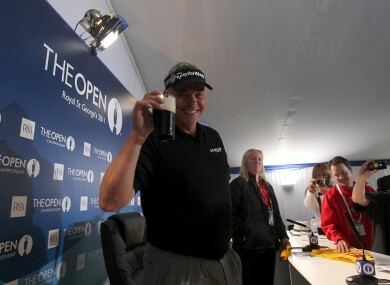 Clarke celebrates his victory with a pint. NEWLY-CROWNED BRITISH Open champion Darren Clarke was seriously considering quitting golf according to his agent, Andrew Chandler. In an interview with The Guardian, Chandler spoke of how he convinced Clarke to take a break from the game back in April, after the golfer became disillusioned due to a poor run of form that saw him finish with a round of 81 in Morocco. Bob Rotella, Clarke’s psychologist, also worked extensively with the golfer in the lead up to the Open. He revealed that Clarke’s frustration with his putting was affecting his entire game and said he was worrying too much about technique. Clarke produced a consummate display at the weekend, winning his first-ever major and continuing Northern Ireland’s incredible record in the sport following Rory McIlroy’s win last month. Email “Clarke almost quit, according to agent”. Feedback on “Clarke almost quit, according to agent”.